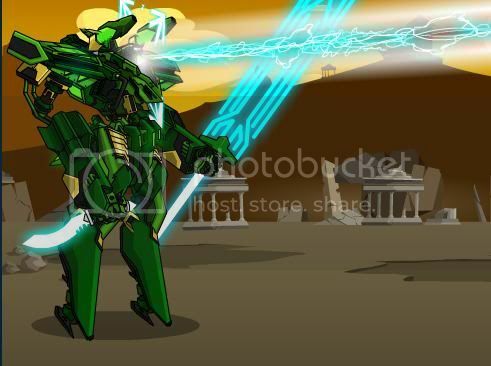 Description: The blade master is a dual wielding melee figher with heavy laser support! This version has a lucky boost of +20! Scales up to level 42! 1st hit has chance for "Slashed Fuel Line: 1.5x Damage Over Time", causes 1.5x DoT, lasts 3 turns. Last hit has an increased chance for a critical hit. 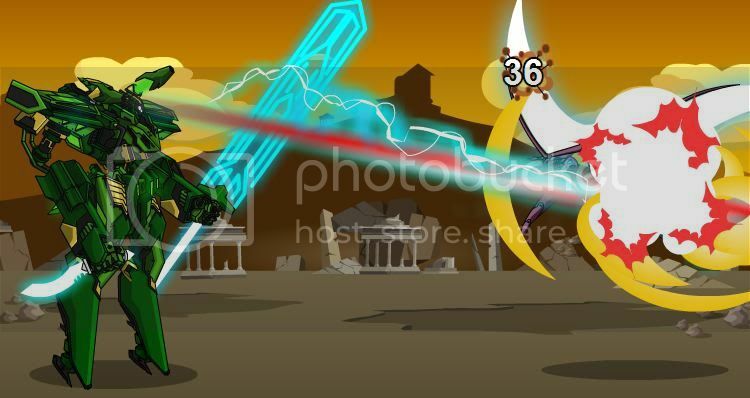 Description: A quick double slash from a powerful energy dagger. Has a high chance to crit and slashes through fuel lines like butter! 1st hit has an increased chance for a critical hit. Last hit has chance for "Fuel Explosions: 1.5x Damage Over Time", causes 1.5x DoT, lasts 3 turns. Last hit has chance for "Power Disruption: 2x Energy Damage Over Time", causes 2x EP DoT, lasts 3 turns. 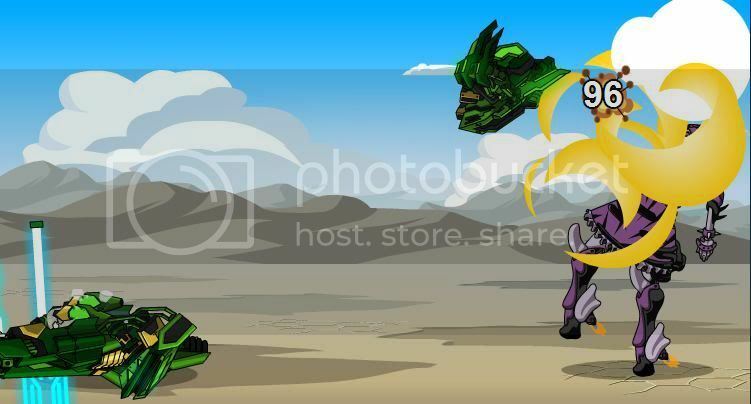 Description: This huge energy blade has incredible range. The blades spread open and cause critical damage when it is pulled out its target. Destroys power systems. Chance for "Over Charged! Extra Shot! ", deals an additional hit of damage. 1st hit has a chance for "Scorched Armor: -10 Defense", lowers opponent's Defense by 10, lasts 3 turns. 2nd hit has a chance for "Visor Burn: -15 Attack Bonus", lowers opponent's Bonus by 15, lasts 3 turns. 1st hit has a chance for "Shield Disruption: -10 Defense", lowers opponent's Defense by 10, lasts 3 turns. 2nd hit has a chance for "Damaged Radar: -15 Attack Bonus", lowers opponent's Bonus by 15, lasts 3 turns. Description: Overclocked laser system that burns hot and has a tendency to overshoot. Locks on to enemy defense and targeting systems. 100% chance for "Unbalanced: -20 to Defense", lowers opponent's Defense by 20. Chance to cause "Unpredictable Weapons Systems" status, 50% chance each turn to lower opponent's damage by 50% "[Opponent]'s Damage Fluctuates: -50% Damage! ", lasts 5 turns. If your enemy is in an equipabble mecha (I.E. PvP or mecha-type enemies), 100% chance for "Severed connector! Disabled X weapon! ", randomly disables one of the following of your opponent's weapons that is not already disabled: Front Arm (fa), Back Arm (ba), Front Shoulder (fs), Back Shoulder (bs). Lasts 999 turns. 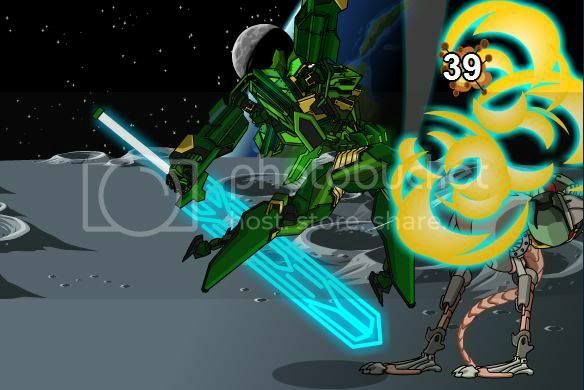 If your enemy is not in an equipabble mecha, 100% chance for an irresistable stun, lasts 1 turn. Description: The torso separates for a wild spinning attack! Disrupts enemy defense and weapons systems. Dismembers equippable enemies and stuns non-equippables. 1st hit has a 100% chance for "Target Acquired: +40 to Attack Bonus", increases Bonus by 40, lasts 3 turns. 2nd hit has a 100% chance for "Overclocked Weapons: +30% Damage", increases Boost by 30, lasts 3 turns. Last hit has a chance for "Armor Dents: -10 Defense", lowers opponent's Defense by 10, lasts 3 turns. Last hit has a chance for "Destablized: -10 Attack Bonus", lowers opponent's Bonus by 10, lasts 3 turns. Description: Focuses a pulse beam for increased targeting and weapon damage. Lowers enemy defense and targeting systems too.